In February 2008, more than 65,000, or 4.8 percent of the 1.36 million active duty personnel in the U.S. military were foreign born. Recent choices by the Trump administration have altered incentives for immigrants to enlist. With annual Veterans Day remembrances just around the corner (November 11), communities across the country will be organizing activities to thank veterans for their service in the U.S. military, past and present. If this Veterans Day is like those of the past decade, the day will also be marked by a number of naturalization ceremonies held in the U.S. and at military outposts around the world for active duty U.S. military becoming U.S. citizens. Though military service is often thought of as a high calling for U.S. citizens, non-citizens with valid immigration status have long been able to serve as enlisted personnel in the U.S. military (officer ranks are restricted to U.S. citizens). The Migration Policy Institute cites USCIS statistics that the “foreign born composed half of all military recruits by the 1840s and 20 percent of the 1.5 million service members in the Union Army during the Civil War.” A fact sheet from the National Immigration Forum further notes that over our history as a country, one in five Medal of Honor recipients have been immigrants (see here for a full list) and that in 2016, about three percent of the living veteran population were immigrants. The 2008 MPI report also noted that almost five percent (approximately 65,000) of active duty military in that year were foreign born, with just over 20,300 of those not yet naturalized. Since then, the average number of non-citizens on active duty has declined somewhat, to an average of 18,700 (based on 2010 to 2016) as the number of active duty immigrants who naturalized while in service grew significantly due to several policy changes. After September 11, a presidential executive order allowed non-citizens with honorable service after that date to naturalize in expedited fashion. A 2009 policy shift set up opportunities for naturalization when a non-citizen completed basic training. In the same year, the Military Accessions Vital to the National Interest (MAVNI) program was set up, allowing non-citizens to fast track their path to citizenship if they enlisted for several years and possessed certain skills in short supply (often linguistic or medical skills). In 2014, MAVNI was briefly opened up to Deferred Action for Childhood Arrival (DACA) recipients. As a result, from 2001 to 2015, 109,321 immigrant military service members became U.S. citizens, including more than 11,000 in ceremonies around the world. The map and box chart below (developed from USCIS data for this column and also viewable in interactive form on Tableau) shows where the largest number of naturalizations occurred outside the United States for fiscal years 2008 to 2015. 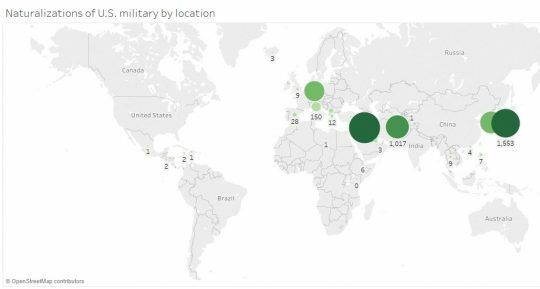 Unsurprisingly, the large majority of naturalizations took place in either areas of significant ongoing conflict (Iraq, Afghanistan) or places with large and long-standing U.S. military bases (Japan, South Korea, Germany, Italy). 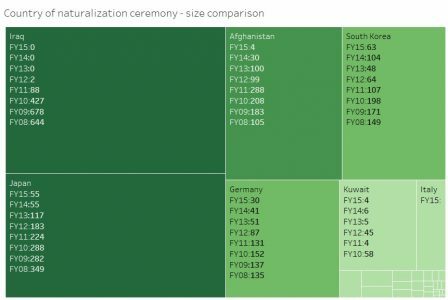 It’s also possible to see from the box chart, sized by total naturalizations over the years in question but listing the numbers for each individual fiscal year, that the number of such ceremonies abroad has tailed off in recent years, perhaps because the number of troops stationed in active conflict zones declined. Certain policy changes by the Trump administration could further curtail future numbers. In April 2017, President Trump and the Department of Defense announced they would continue to recruit non-citizens and to offer those troops who enlisted an expedited pathway to naturalization. However recent reporting this month suggests because of the Trump administrations concerns over immigrants as potential security threats, legal permanent residents will no longer be able to enlist in the Army Reserve or National Guard and will have to delay entry into basic training for active duty service until more stringent security checks can be completed on them (which can take up to a year). New regulations also instituted at 180 day waiting period in the program that gave green-card holders the ability to naturalize during basic training. Despite some successes, the MAVNI program, suspended in 2016 to allow the security checks that were part of the program to be reviewed, reportedly also may be discontinued. This could leave some DACA beneficiary recruits and others with lapsed or expired visas who are already in the enlistment pipeline to face deportation. For more information on the details of military naturalization processes, see the USCIS fact sheet on the topic. Author: Grant Rissler earned his Ph.D. in Public Policy and Administration in August 2017 from the L. Douglas Wilder School of Government and Public Affairs, Virginia Commonwealth University (VCU). A former immigration paralegal, his current research focus is local government responsiveness to immigrants. He also serves as Asst. Director for Programs for the Commonwealth Educational Policy Institute, a program of the Office of Public Policy Outreach at the Wilder School. Grant can be reached at [email protected].